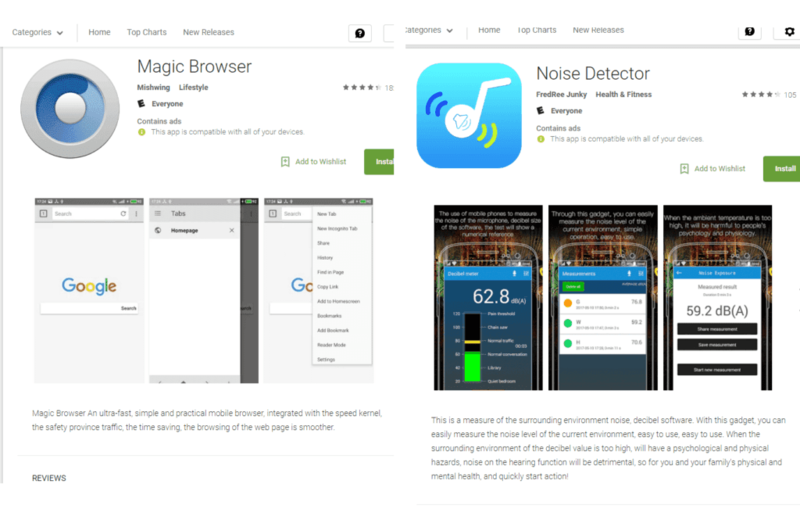 As reported by Kaspersky Lab’s Threatpost, Google removed the applications Magic Browser and Noise Detector (shown in image below) after Kaspersky researchers warned the company of the threat they posed. The threat of these applications lies in the Ztorg Trojan virus that is activated upon download and installation. According to Roman Unuchek of SecureList, the strain of Ztorg found in these apps was “a Trojan-SMS that can send Premium rate SMS and delete incoming SMS” and profit off of the high bill that results from this, as well as any sensitive data contained in other SMS messages sent to the device. According to AVG Threat Labs states, Ztorg has the ability to log your keystrokes and passwords. This can lead to potential root access of your device and control over any Internet accounts that require login like email or bank accounts.